In medieval times, women of high birth essentially only had two “career” options: marry or become a nun. Not that the choice was theirs—in medieval times the future fate of a child was decided by his/her father—but a young woman who openly expressed a vocation to serve God could often sway her father. Becoming a nun was a way of avoiding the uncertainties of childbirth, plus, of course, it allowed the lady in question to theoretically lead a somewhat more tranquil life. In some cases, women who had every desire to marry and have babies still ended up as nuns, usually because their father felt this was a good idea. 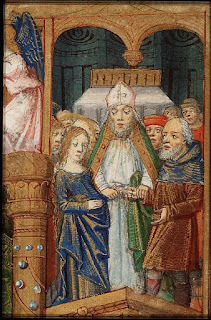 Take, for example, the case of the three de Geneville sisters in the late 13th century, where it was decided the family would best benefit by concentrating the sizeable dower on the eldest girl, thereby making Joan de Geneville a most attractive bride (snatched up by Roger Mortimer, no less). The two younger girls were sent off to a nunnery to take the veil. What they might have thought of all this we don’t know. There were also cases when girls were forcibly veiled by others than their family so as to get rid of them. 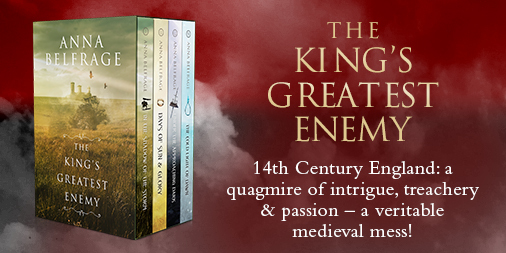 Such was the fate of Llewellyn the Last’s daughter Gwenllian of Wales, whom Edward I had locked away with the nuns at Sempringham Priory. Such was the fate of Hugh Despenser’s three young daughters, who in 1327 were sent off to three different convents and there veiled, thereby removing them for ever from the marital market. Sometimes, however, a nun ended up being a marital pawn no matter what vows she had taken. At times, it may have been the nun herself who regretted her choices and absconded (but to do so was to risk everlasting hellfires). More often, the nun in question ended up being the sole heiress to lands and wealth, thereby attracting ambitious suitors who were willing to risk the opprobrium of the church to feather their nests. One such nun was Marie of Blois. She was also one of those girls who’d had little say in how her life was ordered, seeing as she was destined for the cloisters already as a young child. Her parents, King Stephen of England and Matilda of Boulogne, were devout and what better gift to God than their own precious daughter? Marie was very young when she was placed in a convent. Whether she was delighted at the idea or not, she seems to have adapted, and by the time her father died in 1154, she was about twenty years old and the Abbess of Romsey. Had things gone according to plan, likely Marie would have remained there for the rest of her life, capably managing her little universe. Marie lived in uncertain times. 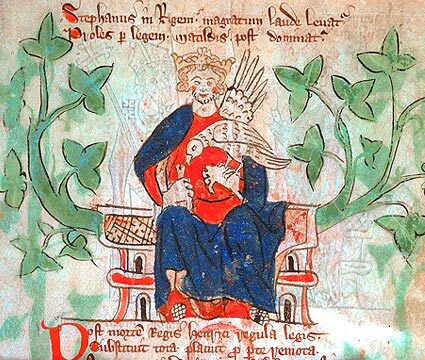 Prior to her father’s death, England had for decades been submerged in a bloody civil war between King Stephen (who effectively usurped the crown) and Stephen’s cousin, Empress Matilda. Initially, Matilda fought to claim the crown for herself. Over time, her son, the future Henry II, took over her claims and managed to force through a treaty with Stephen whereby Henry would inherit upon Stephen’s death. I imagine this did not please Marie—after all, she had a surviving brother who also had a claim on the crown. However, William of Blois was no fool. He swallowed his pride, submitted to Henry and was rewarded with a nice heiress and the earldom of Warenne. None of the above would have had much of an impact on Marie’s life. But in 1160, William died—childless. In one fell swoop, Abbess Marie became a major landowner, inheriting the substantial Boulogne lands that came from her mother. Having said lands under the control of a woman sat somewhat uncomfortably with Henry II, who preferred his lords to be adequately beholden to him for their fiefs and grants: besides, what was a woman—and a nun to boot—to do with all that wealth, all that power? Henry wasn’t the only one thinking along those lines. One of those considering the possibilities offered by William’s demise was Matthew of Alsace, younger son to the Count of Flanders. Being a man of action Matthew decided to make a grab for the prize in the literal sense. Marie, Abbess of Romsey, was therefore forcibly abducted in 1160 and carried off by Matthew who was determined to make her his wife. According to most contemporary sources, Marie was anything but delighted by this turn of events. No matter her reluctance, soon enough she was hauled before an altar and wed. I suppose by then her virtue had been compromised, as demonstrated by the birth of a daughter, Ida, in 1160/61. I’m thinking Marie derived some pleasure from presenting her husband with a girl and not a boy, but truth be told I have no idea what her feelings were for Matthew. She seems to have actively disliked Henry II, thereby indicating he may have given Matthew a discreet go-ahead, this despite the fact that abducting an abbess was a serious breach of canon law. So serious, in fact, that Matthew was placed under interdict. I suppose a marriage that began with an abduction was not destined to be successful. 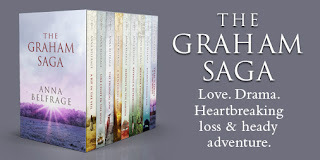 Or maybe it was – after all, Marie stayed with Matthew. This may have been because she had nowhere else to go, but it could also indicate some level of affection. Whatever her thoughts, the Church was not about to let this go: a nun had promised herself to Christ, and unless she received a papal dispensation, those vows were binding unto death. There was no papal dispensation—or at least we can’t find any records of one. Besides, would the Church have kept up the pressure had there been one? But keep up the pressure they did, and by 1170, Matthew’s father was beginning to have serious fears for his son’s eternal soul. So much so, in fact, that the ailing Count of Flanders urged Matthew to accept the Church’s demands that the marriage be annulled. Suddenly, Marie was neither married nor a nun. The man who had once imperilled his own soul—and hers—no longer wanted her enough to risk the Church’s wrath. Poor Marie was in limbo, but the Church offered to welcome her back, and whether this was what she wanted (she had just been delivered of a little girl, so one would have thought she might have wanted to stay with her baby) this was what she did. Obviously, her forays into the outside world had left her religious reputation torn to shreds, which meant Marie returned to her cloistered life as a plain nun. Not for her the lofty station of abbess, not anymore. As to Matthew, he continued to rule Boulogne on behalf of his eldest daughter, Ida. I’m betting there’d been some horse-trading behind the scenes, along the lines of “yes, I can send my wife back to the convent, but my daughters must be declared legitimate”. After all, this was what Matthew had always wanted: to pass Boulogne down to his heirs. Yes, he’d have preferred male heirs, but any heirs were better than no heirs. Matthew died in 1173. Marie remained in her convent, and her daughters were raised by their paternal uncle, the new Count of Flanders. 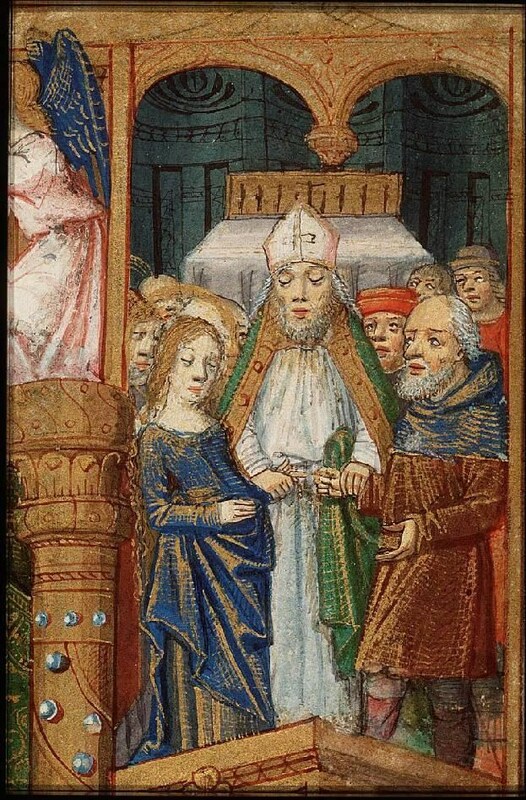 In 1182, Marie died, no doubt relieved to know her eldest daughter was already safely married. Not for her Ida an existence as tumultuous as her own, Marie probably thought, sending off a prayer or two of gratitude to God for having arranged it thus. Turns out all that gratitude was premature, as Ida of Boulogne’s private life would eclipse her mother’s, featuring various husbands and one well-orchestrated abduction. But that, I think, is a subject for another post. Presently, Anna is hard at work with The King’s Greatest Enemy, a series set in the 1320s featuring Adam de Guirande, his wife Kit, and their adventures and misfortunes in connection with Roger Mortimer’s rise to power. And yes, Edmund of Woodstock appears quite frequently. The first book, In The Shadow of the Storm was published in 2015, the second, Days of Sun and Glory, was published in July 2016, and the third, Under the Approaching Dark, was published in April 2017. The fourth instalment, The Cold Light of Dawn, was published in February 2018. I think many often dismiss those of a religuous following as having boring lives, but in reality this is far from true! As so intriguingly relayed here, the lives of nuns and abbesses could at times be more adventurous than those outside the convent walls. Thank you for sharing such an interesting life! 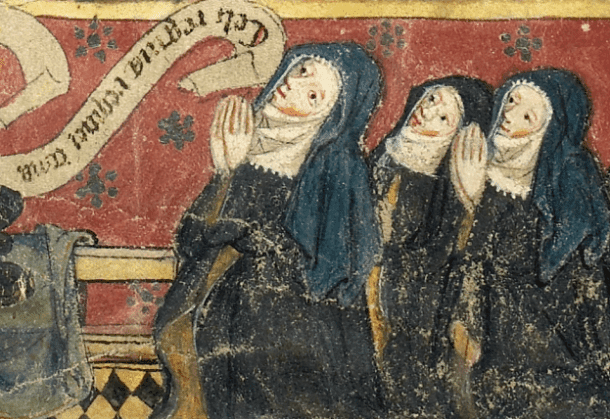 Abducting abbesses seems to have been a common sport (why all so often the abbess? Did ordinary nuns never get a look-in - or were their abductions not important so were not made a fuss of?) Harold Godwineson's (later King Harold II) elder brother, Swein abducted a nun and they had a son, Hakon, who fought, and died beside Harold at 'Hastings' in 1066. We always hear, however, how these incidents were abductions but I wonder how many were planned deceptions? 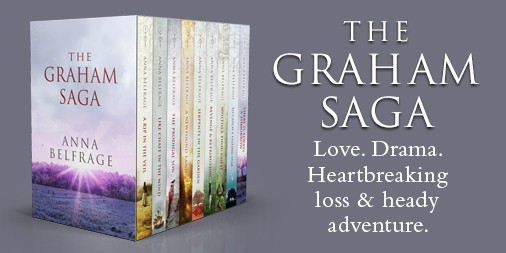 A genuine love affair with the woman wishing to escape with her lover? I think many women, however preferred a life as a nun (as Elaine Moxon says) life in a nunnery was not all gloom and doom and it meant avoiding the one fear most women must have had - dying in childbirth. Interesting post Anna - and thereby hangs a novel? Or maybe the lowly nuns were not considered important enough to mention..Yes, I agree: there were probably cases where the nun was more than delighted at being carried off. But in general, whether nun or not. I think many of the women abducted and forced into marriage were less than happy.